We’d love your help. Let us know what’s wrong with this preview of Chrysalis by Kim Todd. To ask other readers questions about Chrysalis, please sign up. Now theme and content wise Kim Todd's biography of Maria Sibylla Merian (Chrysalis: Maria Sibylla Merian and the Secrets of Metamorphosis) does indeed present a detailed and yes also very much meticulously researched portrait of Maria Sibylla Merian's life and times (a generally truthful depiction of an artist and scientist who might have lived in late 16th and early 17th century Germany and Holland but who with regard to her artistic endeavours and especially her science was definitely much ahe Now theme and content wise Kim Todd's biography of Maria Sibylla Merian (Chrysalis: Maria Sibylla Merian and the Secrets of Metamorphosis) does indeed present a detailed and yes also very much meticulously researched portrait of Maria Sibylla Merian's life and times (a generally truthful depiction of an artist and scientist who might have lived in late 16th and early 17th century Germany and Holland but who with regard to her artistic endeavours and especially her science was definitely much ahead of her time, in particular concerning insect metamorphosis and questions of what we now consider ecology). However and the above having been said and after I have in the past year both read and indeed totally loved and appreciated two geared towards older children but also very much suitable for interested adults biographies of Maria Sibylla Merian (Joyce Sidman's 2019 Sibert Medal winning The Girl Who Drew Butterflies: How Maria Merian's Art Changed Science and Sarah B. Pomeroy's Maria Sibylla Merian: Artist, Scientist, Adventurer), I guess I was absolutely and totally expecting Kim Todd's Chrysalis: Maria Sibylla Merian and the Secrets of Metamorphosis to feature if not the same then at least still a very similar type of writing style as the two above mentioned and in my humble opinion utterly brilliant tomes, namely presenting just or for the most part only the known hard-core facts of Maria Sibylla Merian's life story (with perhaps a few cultural and historic supplemental inclusions and discussions regarding 16th/17th century Europe, the history of science, details on the Dutch colony of Surinam etc.) and all recounted in a readable, concise but at the same time never once overly dry and monotonous style of narrational expression. So one of my least favorite things about autobiographies is when the author takes huge leaps of assumption on the inner lives of their subjects. 'As a woman, she must have felt this about that in this time,' etc. But in her defense, there was no other way to write about Maria Sibylla Merian- what a fascinating lady- gallivanting around Europe & South America collecting, studying and drawing bugs- incredibly detailedly (not a word i think), beautifully and prolifically and leaving almost no So one of my least favorite things about autobiographies is when the author takes huge leaps of assumption on the inner lives of their subjects. 'As a woman, she must have felt this about that in this time,' etc. But in her defense, there was no other way to write about Maria Sibylla Merian- what a fascinating lady- gallivanting around Europe & South America collecting, studying and drawing bugs- incredibly detailedly (not a word i think), beautifully and prolifically and leaving almost no record of anything else. It made me want to seek out reproductions of her work. And it left me with great questions about the nonsense western people believed several hundred years ago and how they went about forming/changing/adapting new beliefs. But really how could people living agriculture based lives believe that some critters were products of spontaneous generation. As told here anyway, the main reason to seek proof against spontaneous generation was because if critters- or maggots actually- could generate at the drop of a dime- or a cow in this case- then that 'fact' disturbed their belief in god. Because god created all things in the first six days, that's why. And really only a very few people were actually observing what was going on right in front of their noses in their hedges and gardens all the time. A good metaphor for the mess we're in today. This is the seventeenth/eighteenth century life and legacy of a remarkable artist and scientist--and a woman, a German, a divorcee, a religious fanatic, and world traveler, all. Maria Merian studied and painted and engraved images of insects, ultimately traveling, in her fifties, to Surinam to continue her work, before returning to Europe. This is an engaging, delightful book. Where other biographers complain about the lack of source material (or worse, take guesses), Ms. Todd fills the gaps wit This is the seventeenth/eighteenth century life and legacy of a remarkable artist and scientist--and a woman, a German, a divorcee, a religious fanatic, and world traveler, all. Maria Merian studied and painted and engraved images of insects, ultimately traveling, in her fifties, to Surinam to continue her work, before returning to Europe. This is an engaging, delightful book. Where other biographers complain about the lack of source material (or worse, take guesses), Ms. Todd fills the gaps with rich details from Merian's surroundings. Although we can never truly get within her subject's head, for Merian left such a scanty record aside from her art and her notes, there was never a point where I felt the lack. I saw this great book, opened at a different page each week, in the British Museum in London. The illustration was just breathtaking, having been created by Maria Sibylla Merian. I came away determined to find out more about this woman, so bought this sturdy book by Kim Todd. Initially I was a little disappointed that there are so few illustrations, but the story is enralling. She was born in Germany 13 years after Galileo was prosecuted for proclaiming that the earth orbited the sun. In 1699, at I saw this great book, opened at a different page each week, in the British Museum in London. The illustration was just breathtaking, having been created by Maria Sibylla Merian. I came away determined to find out more about this woman, so bought this sturdy book by Kim Todd. 2 and 1/2 stars. This book celebrates the life of a unique contributor to scientific knowledge in the 17th c.--a woman, a wife, a mother, and a divorcée, who yet was a successful artist, engraver, scientific observer, business woman, traveller, and writer and illustrator of books. Remarkable for a woman in her time and place, and her artistic and scientific achievements would have been remarkable for anyone. A student of insects since the age of 13, she was fascinated by the process of metamorph 2 and 1/2 stars. This book celebrates the life of a unique contributor to scientific knowledge in the 17th c.--a woman, a wife, a mother, and a divorcée, who yet was a successful artist, engraver, scientific observer, business woman, traveller, and writer and illustrator of books. Remarkable for a woman in her time and place, and her artistic and scientific achievements would have been remarkable for anyone. A student of insects since the age of 13, she was fascinated by the process of metamorphosis. The child of an artistic publishing family, she was able to present this process on paper in such a fashion that it added immeasurably to the growing perception that insects were not created by spontaneous generation. Her hand-colored engravings are also remarkably lovely. Reading this book was a bit of a slog. Ms. Todd has a consciously literary, but (to me) not very engaging style, so much of the abundant information about the state of biological science in the 17th century, interesting in itself, is hard to plow through. Much about Maria Sibylla Merian's life is unknown, and it is natural to speculate about why she might have done something. Ms Todd's speculations about why Marian left her husband, and why she entered the monastic Labadist community with her mother and daughters, however, boldly go very far in the direction of the imagined. I felt by the end of the book that I was better off with the ten or so pages of unspeculative biography included in the edition of Merian's New Book of Flowers I just read. Worse, there are many small errors. Ms. Todd could have used a good copyeditor, if they still existed. (Although that would not have corrected her misunderstanding of plates in Merian's New Book of Flowers, which I think she underrates.) Maps might have been helpful. I lunched with a group of ladies yesterday and all they talked about was how old they were and they could no longer do things that younger people do! BORING! Age is a state of mind. Well obviously they did not know Maria Sibylla Merian. After Galeio and before Darwin, at ag e 50, Merian left her husband and sailed from Amersterdam to Suriyam to study the metamorsphis of butterflies. Disguising her interests as art, she influenced naturalists from generation to generation. I felt that this dragged at times and I was expecting more of an actual biography of Merian. The author used too many "maybes" and "what ifs" to make this a compelling look into Merian's life. Instead, for me, this became more of a look into the history of the birth of biology and ecology as a science. I would recommend this only for people with a strong interest in the biological sciences. 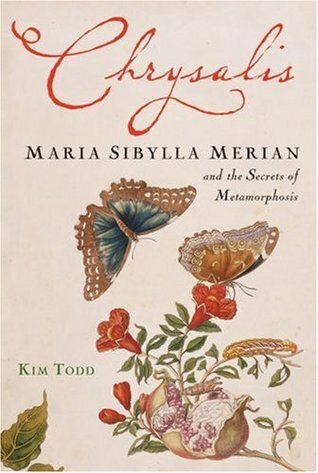 A book about Maria Sibylla Merian, a woman who was early in the field of insect and plant study and painting, with a unique emphasis on metamorphasis. The book starts off by disclosing that there is very little known about her except for a few archival materials, and her illustrations. But Kim Todd, the author, combines her story wonderfully and informatively with the history of the times (mostly late 1600s, early 1700s). Todd was clearly enchanted by her subject and her illustrations, and makes A book about Maria Sibylla Merian, a woman who was early in the field of insect and plant study and painting, with a unique emphasis on metamorphasis. The book starts off by disclosing that there is very little known about her except for a few archival materials, and her illustrations. But Kim Todd, the author, combines her story wonderfully and informatively with the history of the times (mostly late 1600s, early 1700s). Todd was clearly enchanted by her subject and her illustrations, and makes it clear that for a woman to be doing this work at this time displayed a unique spirit and drive. The book flap says that Todd has a degree in "creative non-fiction," which I'd never heard of, but that's exactly what this book does, creatively tells a true story. She takes a subject that I would have thought was not especially interesting, to me, and just makes it soar. This is an area of study that I had no idea I was interested in! The book left me feeling smarter and optimistic about, well, life by tell the story with the emphasis on a woman overcoming large obstacles through her fascination with metamorphasis, but as Todd portrays it...transformation. Enjoyed this story of a woman who had to fight against the social norms and expectations of the day (early 17th century) to satisfy her need to research and *know*. She was fascinated by the concept of metamorphosis at a time when many scientists and philosophers simply assumed the principle of spontaneous generation explained the appearance of flies on rotting meat, or roaches and mice from soiled clothes. She used natural observation and meticulous scientific illustration to document the proces Enjoyed this story of a woman who had to fight against the social norms and expectations of the day (early 17th century) to satisfy her need to research and *know*. She was fascinated by the concept of metamorphosis at a time when many scientists and philosophers simply assumed the principle of spontaneous generation explained the appearance of flies on rotting meat, or roaches and mice from soiled clothes. She used natural observation and meticulous scientific illustration to document the process of metamorphosis in insects, especially butterflies. Eventually, she traveled to Surinam to research and document the unknown South American insect and plant life because she had exhausted the subjects available to study in the region around Amsterdam. She struggled with being taken seriously by the scientific community and her reputation as an illustrator/naturalist went through a metamorphosis as her work was ridiculed, then plagiarized, then commended well after her death. All in all, this book was well worth my time to read it. And it wasn't quick for me to read. I found this book by accident on the library shelf, and I ended up learning a lot about someone I'd never heard of before, who was innovative in a field I'd known only superficially before. I have only two criticisms, both of which are more my hang-ups than the book's. This a well-researched book. It is obviously not fiction, but at times it read like a dissertation or a textbook. The footnotes, bibliogra All in all, this book was well worth my time to read it. And it wasn't quick for me to read. I found this book by accident on the library shelf, and I ended up learning a lot about someone I'd never heard of before, who was innovative in a field I'd known only superficially before. I have only two criticisms, both of which are more my hang-ups than the book's. This a well-researched book. It is obviously not fiction, but at times it read like a dissertation or a textbook. The footnotes, bibliography and index only reinforced that feeling. There were parts of this book I just loved. I'm a butterfly fanatic of sorts and a feminist of sorts so it was incredible to read about a woman in the early 17th century who studed metamorphosis & butterflies! The book includes examples of some of the many watercolors and etchings Merian created while studying the caterpillar and butterfly. The book is categorized as 'creative non-fiction'. It's all facts with a little bit of speculation on the part of the auther. However, the narrative lost There were parts of this book I just loved. I'm a butterfly fanatic of sorts and a feminist of sorts so it was incredible to read about a woman in the early 17th century who studed metamorphosis & butterflies! The book includes examples of some of the many watercolors and etchings Merian created while studying the caterpillar and butterfly. An artist turned naturalist, Maria Sibylla Merian was born just thirteen years after Galileo was prosecuted for claiming the earth orbited the sun. But in 1699, more than a century before Darwin or Humboldt, she sailed from Amsterdam to South America on an expedition to study insect metamorphosis. It was an unheard of journey for a naturalist at that time, much less a woman, and she undertook it at the age of fifty-two, with only her daughter for company. I am curious to read about this 17th century woman artist/botanist who was of a great importance in showing the world metamorphosis. Having been drawing nature in detail and small scale these last few years, I look forward to Maria Sybilla Merian's drawings. (and I think it's time for me to do some travelling again........far, far away). I was so excited to read about Maria Sibylla Merian, a truly amazing person, but this book just didn't hold my interest. I didn't even finish it...I just couldn't, which is rare. I realize that not much is known about her life, so the author had to extrapolate, etc. I will just have to be content with the snippets of information about her that I can find from other sources. In the late 1600s, early 1700s, a woman named Maria S. Merian works as an illustrator and naturalist, creating amazing renditions of caterpillars and other insects. The author does not have lot to go on, but she manages to create a readable and interesting story. The last chapters get a bit heavy on the women's studies angle--but otherwise, it is a decent book. Not all that scholarly (how is her father in law a high school teacher in early modern Europe? ), but very interesting and a good introduction to Merian's life and the natural history milieu at the time. A little too dry for my liking. Each time I felt like putting it down for good the narrative would pick up and propel me through until the next rough patch. Just too dry for my taste. What a wonderful woman, so far ahead of her time. I wish I had more patience, I would love to learn more about her. I picked this book up off the browsing shelf at the Mercantile Library, without having ever heard of Maria Sibylla Merian, mostly because it had an appealing cover. Besides, the Mercantile's collection is small but well chosen; once you're inside, you can be reasonably sure that all of the books are good. That gives me a lot of confidence when checking things out on impulse. This book is a fascinating story about an early naturalist who is largely forgotten by history, an inspiring tale of a woma I picked this book up off the browsing shelf at the Mercantile Library, without having ever heard of Maria Sibylla Merian, mostly because it had an appealing cover. Besides, the Mercantile's collection is small but well chosen; once you're inside, you can be reasonably sure that all of the books are good. That gives me a lot of confidence when checking things out on impulse. This book is a fascinating story about an early naturalist who is largely forgotten by history, an inspiring tale of a woman who went her own way in a time when women's choices were limited, and a surprising example of how an author can write a biography of a person about whom little is known. Maria Sibylla Merian broke out of the mold of 17th-century women's "place" and she may have been the first ecologist. She studied plants and insects and their interactions and she combined art and science by her innovative illustrations. She was the first (so the author says) to create illustrations that combine plants and insects. She was endlessly curious, starting with a collection of silkworms when she was 13. The high point of her life was her two-year trip to Surinam (Dutch colony in South Maria Sibylla Merian broke out of the mold of 17th-century women's "place" and she may have been the first ecologist. She studied plants and insects and their interactions and she combined art and science by her innovative illustrations. She was the first (so the author says) to create illustrations that combine plants and insects. She was endlessly curious, starting with a collection of silkworms when she was 13. The high point of her life was her two-year trip to Surinam (Dutch colony in South America), where she studied and collected insects and plants, many of them in the rain forests. I have to give a caveat to this book by noting that the author had little to base this biography on because there is so little that Maria wrote (only 17 letters exist) and few documents exist (her will and some other court documents). So Todd assumed a great deal to turn the few facts into an entire book. In general, she did a good job but she did tend to exaggerate. From only a little evidence about the state of Merian's marriage to Johann Graff she says, "...something had rotted at the core of the marriage." Todd enlivens the book with discussions about the natural sciences of the time and the men who worked in this area. Most interesting was her discussion of how these scientists viewed metamorphosis. Many believed in spontaneous generation - that maggots, for example, were generated from rotting meat. Merian's experiments proved them wrong. Merian has been rediscovered today; you can buy copies of her prints and there are several books out about her, some of them for young readers. Much of that new interest is the focus on women scientists and some of her proto-ecological views. An excellent biography of a lost female leader whose hard work at documentation aided our understanding of metamorphosis. Merian's life was as extraordinary as her art, so this was a very thrilling read. I read this book several years ago and still am inspired by Merian's story, as told by Todd. I really enjoy reading about insects, natural history, and women in science, so this was a great book for me.